FOXBOROUGH, Mass. – On a feel-good night when the New England Patriots secured a sixth Super Bowl appearance during the Bill Belichick era, giving them a shot at a fourth championship that could forever silence the last of the critics who claim their greatness was derived from Spygate, the report hit about 1 a.m. here. Citing league sources, Bob Kravitz of WTHR-TV in Indianapolis, said "the NFL was investigating the possibility the Patriots deflated football Sunday night." Kravitz, a former Indianapolis Star columnist, tweeted that "at one point the officials took a ball out of play and weighed it." And so here we go again … just in time for two weeks of Super Bowl hype. NFL spokesman Michael Signora confirmed to Yahoo Sports that the league "is looking into the matter." There are details still to come, to say the least, including an investigation that could very well clear the Patriots. This much is undeniable: It was a wet night in Foxborough, with rain often coming down in a deluge. Deflating a football, even slightly, can aid the ability to grip the ball, an obvious advantage in passing, catching or accepting handoffs. In the NFL, each team brings 12 Wilson footballs to the game and uses its own. As such, the Patriots' offense uses one set of footballs and those are taken off the field when possession shifts. The Colts then bring theirs into rotation. It is not uncommon for teams to try to alter, however slightly but within the acceptable limits between 12.5 and 13.5 pounds, the ball that is most agreeable to their quarterback. So if New England was actually using an illegally inflated ball, it would only help their offense and not hurt the Colts' offense. All game balls are to be checked by the referee, in the officials' locker room, two hours and 15 minutes prior to kickoff. "The Referee shall be the sole judge as to whether all balls offered for play comply with these specifications," Rule 2, Section 1 of the NFL Rule Book reads. "A pump is to be furnished by the home club, and the balls shall remain under the supervision of the Referee until they are delivered to the ball attendant just prior to the start of the game." Each team can bring additional backup balls and a case of balls sent directly from the manufacturer is opened by the referee and marked for kicking only. Even if the footballs used by the Patriots were checked and approved prior to the game, they could conceivably be doctored and deflated during the game. The home team is responsible for providing sideline attendants who supply the refs with balls as on-field action dictates. To concoct a plan that relies on busy attendants altering the ball during the rush of a game in the middle of a stadium with dozens of cameras would be beyond brazen. One false move and a ball could be significantly deflated and cause the refs to realize what is happening. Assuming the attendants would maintain their silence later is even riskier. The Patriots won 45-7. A deflated football isn't that much of an advantage, and turnovers and dropped passes were not an issue in the game – the Patriots offensive line's ability to bulldoze gaps for the running game was. Kravitz reported the penalty, should the Pats be found guilty, would be assessed through lost draft picks. The game is final. New England will play Seattle in the Super Bowl on Feb. 1 in Arizona. All of that said, this is one more accusation of skirting the rules that comes down on Belichick, one more storyline that will perpetuate the "cheating" Patriots whether it's fair or accurate. At this point, New England could be completely exonerated or the league could refute the report completely, and this could come out as nothing more than sour grapes from Indianapolis, and some people would still believe it. To some, we're at that point with the Pats. There is a reason they are arguably the most hated team in the league. 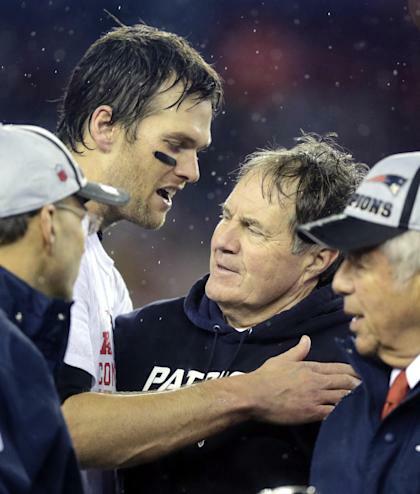 It's nothing New England wants to deal with in the run-up to another Super Bowl. The fact they won three championships prior to getting busted by the league for videotaping opposing teams' sideline signals in 2007, and none since, has been a rallying cry for critics. In fairness, since Spygate hit on the opening game of the 2007 season, New England has compiled a 99-28 regular-season record. They reached two Super Bowls and lost on dramatic, late game-winning drives by the New York Giants, one thanks to the famous David Tyree helmet-catch. "They went what, -0 that year?" former Patriots Willie McGinest said of the 2007 Pats, dismissing the suggestion that Spygate should still be a topic. It's long been the belief in New England that the league office caused the scandal to be overblown. Critics of the team, however, counter that commissioner Roger Goodell destroyed the Spygate tapes, leaving unanswered questions. And now, no matter New England's interest in moving on, here come the same old suspicions and suggestions. Here comes the well-worn storyline, with fresh grist for the mill. Monday should bring more clarity and perhaps some confirmation, perhaps some explanation. Belichick is scheduled to be on a media conference call at 3 p.m. ET. Who knows what's to come? On a night when the franchise delivered a show of force, when it returned for another crack at another much-coveted title, here comes the same old, same old. It's never dull in Foxborough.